Aries Marquee Hire offer Tent Hire for all types of events and garden tent hire for garden parties. Aries tent hire Liverpool, Wirral, Lancashire, Manchester, Cheshire and throughout the North West. Our tent hire can be erected on a grass area or hard standing and can be hired from a one day period for a one day event to long term hire, costs depend on the size and the length of hire. Want to hire a Tent and not sure what size you need? Tell us what you want to fit inside the tent and we will be able to advise you what size you will need to hire. We will work with you to fit within your budget. We work regularly providing tent hire for local councils and housing associations. We can provide tent hire on its own as a cover,or we can provide a wooden flooring to give a solid base and put carpet on top. If you want it to look more fancy we can incorporate linings to dress the tent. As well as providing tent hire we can offer all the accessories that you need to hire including table and chair hire, stage hire, pa systems, dance floors, red carpet entrances and much more. Why Choose Aries Marquee Hire for Tent Hire? 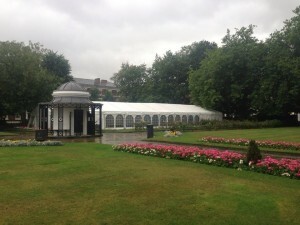 Call Aries Marquee Hire today for Tent Hire we offer our tent hire services anywhere in Liverpool, Wirral, Lancashire, Manchester, Cheshire and throughout the North West. Aries Marquee Hire have a number of solutions for your tent hire and we can discuss your tent hire requirements to ensure we can offer the right solution for you. Please feel free to call us on 0151 545 0599 and speak to one of our friendly staff. Alternatively, please feel free to email us with your details – we normally respond to all enquiries on the same day.